An ESL lesson plan that contains practical activities, games and resources for teaching indefinite pronouns to intermediate level English students (A2). You can use this collection of ideas as a stand-alone lesson plan, or to supplement an existing one on a similar or related topic. If you use an iOS or Android device, don't forget that you can get offline access to these materials, along with a much more extensive selection of ESL lesson plans, through the TEFL Handbook app. You may find that students at this level are already familiar with some or most of these. However, they will still confuse these and continue to make small errors even into intermediate. 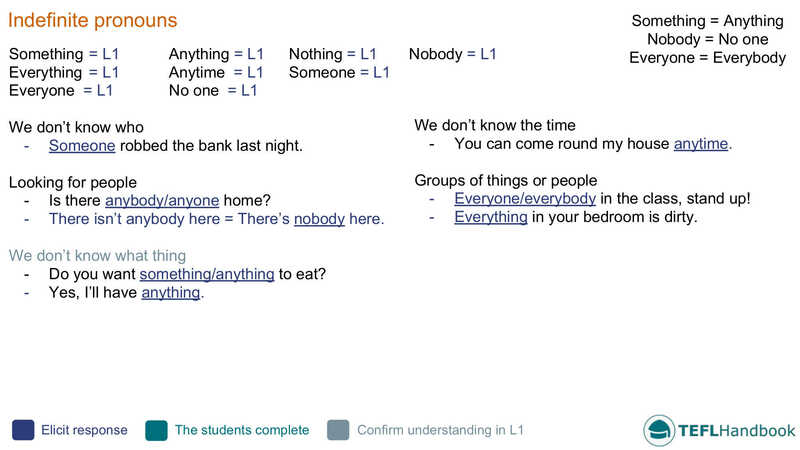 Start off by eliciting and explaining the meaning of each indefinite pronoun. Add the L1 translations if you wish. After that, step through each functional use on the board and try to elicit an example sentence. 1. John is living somewhere in China. 2. I’ve done everything on the list. 3. He heard something moving around in the trees. 4. Adam is very brave, nothing scares him. 5. Everyone is going to David’s party. 6. Is there anything on TV tonight? 7. Mary didn’t say anything to us. 8. You can collect the children anytime, I’ll be here all day. 9. They sold everything in the shop. 10. There’s someone at the door, you better answer it. You could even turn this into a fun team game, where you give a point for the funniest sentence. If you decide to do that, award points as part of the next activity. Following on from the previous exercise, students discuss their sentences and provide corrections/improvements to the other groups. If you are playing this as a game, award points for the funniest sentence. We hope that you were able to grab a few ideas from this lesson plan. Be sure to check out our complete collection of elementary level lesson plans, A2 lower and A2 upper. For other levels, have a look at our entire collection of ESL activities. Also, if you are an iOS or Android user, the best way to view this content is through the TEFL Handbook app. An ESL lesson planner for English teachers, designed for in-class use.